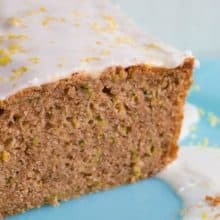 Lemon Zucchini Bread is a fabulous new way to use up zucchini during the summer! Grease and set aside a loaf pan. In a bowl, beat together the zucchini, sugar, egg, and oil. In a separate bowl, whisk together the flour, salt, baking soda, and baking powder; then stir in the cinnamon,lemon zest. Stir the flour mixture into the zucchini mixture until just mixed in completely. Pour the batter into the prepared loaf. Bake 45-55 minutes in the preheated oven, until a knife or cake tester inserted in the center comes out clean. Remove from heat, and cool about 10 minutes. Turn out onto a wire rack or plate. Whisk together the glaze ingredients and pour over top of the loaf. Let cool completely, then slice and serve.